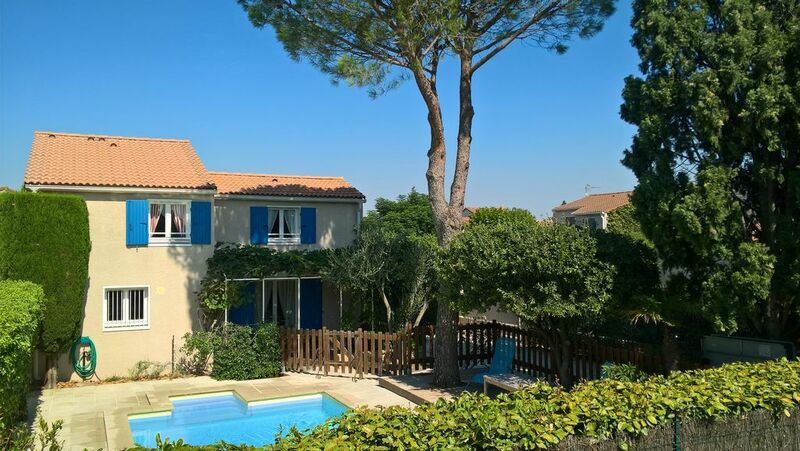 The villa is located in Provence, in the heart of a beautiful region, in the small town of Vedène, 7 km from Avignon (15 minutes by car), in a quiet area, 5 minutes walk from the center and shops. as private and secure pool with both a fence and an alarm. The separate kitchen and living / dining room open onto a south facing terrace with pergola, garden furniture and barbecue. 3 bedrooms (with fans for the summer) and the bathroom / toilet is located upstairs (WC also on the ground floor). The house is well equipped for babies and young children. The car can be parked in the garden, in the shade of tall cypress trees. Possibility of providing linens for beds, towels and table. Family holiday home in a quiet place, without any view on neighbours. The garden very quiet and well arranged to enjoy the sun or natural shade trees to spend pleasant moments on the terrace, the pool, around a ping pong table or a game of petanque. The house is very bright with 3 large bedrooms. Hot water by electric cumulus, operating in automatic switch on the price peak hours. Terrace with pergola accessed from the dining room and kitchen with garden furniture. Beach rest and tan with sun loungers around the pool. Secure outdoor swimming-pool (alarm and fence). Length : 8m Width : 4m Depth : gently sloping from 1m to 1m80 Bubble cover. Five of us stayed here for a week, and it was a bit of a wrench to leave at the end! The temperature was in the high 30s while we were there, and this place was our haven to return to after a hot day's sightseeing. The pool was absolutely lovely, and bigger than we'd imagined, and at any time of the day there always seemed to be a choice of sunny and shady places to sit at the side. We also enjoyed the table tennis equipment. The dining terrace area was great too. The photos don't do justice to the inside of the house, which felt very modern and clean. The air-conditioning was very welcome. Note that it's only in the living room - at first we were worried about this, but the bedrooms all had large efficient fans that stopped us getting too hot at night. The house is quite expensive - we certainly spent a lot more than we've ever done before for a week away, but we agreed that the luxuries were worth it. If we could stay again, we would definitely do so. The location was very convenient for exploring Provence - across the week we made trips to Avignon, the Pont du Gard, L'Isle sur la Sorgue, Orange, Arles, Les-Baux-de-Provence, and Roussillon (this last was a favourite - definitely recommend doing the ochre quarry trail there). We spent a very pleasant week at Cigale Bleu it was exactly as described in the advert, all the equipment and fittings were of good quality and furniture was good quality and comfortable, perfect location for exploring the surrounding area of this lovely part of Provence, the greeting by Magali was excellent, Thank you Dominique. La Cigale est une jolie maison, très confortable et joliment décorée, au sein d'un quartier très calme. L'aménagement (et particulièrement la terrasse ombragée à l'abri du mistral, la piscine et le terrain de pétanque) nous a permis de passer un séjour agréable en famille. Que du positif. Nous avons passé un séjour formidable. La maison est très confortable, bien équipée et la piscine est très agréable. Wir haben unseren Aufenthalt in dem Haus sehr genossen. Es hat an nichts gefehlt, alles ist sehr gepflegt, sauber und das Haus liegt in einer äußerst ruhigen Wohngegend in Verdène. Einziger Kritikpunkt wäre, dass die Schlafzimmer nicht klimatisiert werden können. Dafür sind an allen Fenstern Fliegenschutzgitter angebracht, was sehr nützlich ist. Sowohl die Abwicklung vorab als auch vor Ort war reibungslos. Wir haben uns sehr erholt und können das Haus durchaus empfehlen! Nous avons passées un très agréable séjour dans cette jolie maison de bon style. Tout est dans un très bon état. La maison est super equipée et très propre - merci beaucoup à Magali, qui s'occupe de la maison et nous a accueilli. La cuisine a tout ce que vous avez besoin pour préparer même un diner pour plusieurs personnes. Il y a un accès à la terrasse où vous pouvez rester même quand il fait très chaud. Pour se rafraichir dans la piscine, il faut seulement cinq pas de la terrasse. Vous pouvez y nager sans être vu par les voisins. Le quartier est très calm. L'emplacement est idéal pour passer des vacances reposants . En même temps, vous n'êtes pas loin de la ville d'Avignon. A Védėne il y a tous les commerces - un très bon boulanger, un petit Carrefour et plusieurs bars et restaurants. Merci beaucoup pour votre commentaire. Nous avons été heureux de pouvoir mettre notre maison à votre disposition afin de profiter au mieux de vos vacances. Nous vous accueillerons à nouveau avec plaisir ! At 500 meters from shops and the town center of Vedène and 3 km from the large shopping area Auchan Le Pontet. 15 minutes from the historic center of Avignon with its famous bridge, the Palace of the Popes, its ramparts, its festival in July and the Horse Passion Show in January. 20 minutes from Isle sur la Sorgue and its flea markets, Cavaillon, Carpentras and its market, Orange and its ancient theater. the Camargue, sanctuary for wildlife and flora. The Mediterranean beaches are within an hour's drive: Les Saintes-Maries-de-la-Mer, La Grande-Motte, Le Grau-du-Roi, Carry-le-Rouet, Cassis and the Calanques. 45 minutes from Pont du Gard, Nimes and Arles with their arenas and ferias, Vaison-la-Romaine. Sur demande : - tarifs préférentiels pour la location de 2 semaines consécutives et plus - ménage de fin de séjour en option : de 90 € TTC (non obligatoire) - linge de maison fourni, comprenant linge de lit (drap housse, drap plat ou housse de couette selon saison, taie d'oreiller), linge de toilette (drap de douche, serviette de toilette, gant) et 2 torchons pour la cuisine.